In 1871, many of the privileges that had been guaranteed to the Volga German colonists by Catherine the Great's Manifesto were withdrawn by decree of the Czar. In 1874, the exemption from military service that was promised in perpetuity was stripped from the colonists. For many Volga Germans, military conscription was the last straw. The strong push to Russify the ethnic Germans combined with increasing land shortages at home and reports of plentiful farmland in America caused many to seriously consider emigration. Title page of the Russian passport held by the Heinrich Döring family from Norka. The Döring family immigrated to the United States in November 1903 and settled in Portland. They later changed the spelling of their family name to Derring. Courtesy of Steve Schreiber. Starting with a trickle of immigrants in 1875, thousands would depart for America in the following decades. 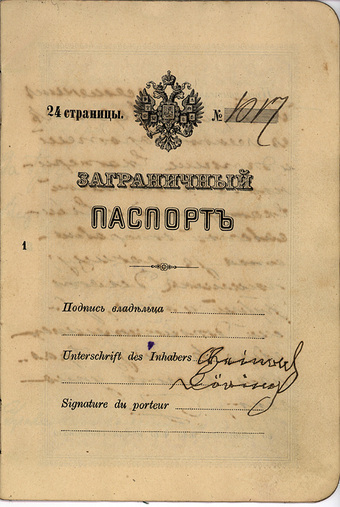 Those who settled in America wrote to their family and friends in Russia, encouraging them to immigrate. Periodic famines in the Volga region, early signs of an impending revolution in Russia, lack of sufficient farmland and a desire for greater educational opportunities also spurred the movement of many to America. This mass migration was slowed by World War I and then halted by the Russian Revolution and Civil War beginning in 1917. It is estimated that about 25 percent of the Volga Germans emigrated, primarily to North and South America. Those who remained in Russia would suffer war, famines and deportation to Siberia and Central Asia. Haynes, Emma Schwabenland. Emma's Thesis - The German-Russians on the Volga and in the United States. AHSGR Central California Chapter. 1996. Print. Koch, Fred C. The Volga Germans: In Russia and the Americas, from 1763 to the Present. University Park: Pennsylvania State University Press, 1977. 192-94. Print. Scheuerman, Richard D., and Clifford E. Trafzer. The Volga Germans: Pioneers of the Northwest. Moscow, ID: University of Idaho, 1980. Print. Last updated March 2, 2018.